A call for repatriation of African Art. For years the African culture has been stolen by colonial masters who disintegrated our culture taking all the riches our culture was founded on, exporting it to their land and replacing it with their culture at the aim of making us think we never understood or had beauty in our land, we were stripped of our own value by these foreigners on our land. By taking away our culture the generation after had no part of their history to help identify what and who they are, the art of their history was taken, leaving them baseless and without a sense of their heritage. When Picasso first encountered classical African art, he said the clarity of the work is that it doesn’t try to represent or show aesthetics—it tries to embody something much deeper: objects with a soul, Dokolo shared with Artnews. Returning stolen art has for a long time being part of a wider campaign for reparations from Western governments to African countries they conquered through slavery and colonization which contributed significantly to the wealth of the west and impoverishment of colonized societies. Africans have been told for years we lack beauty by our colonial nations just so they can take our beauty as their own, white-wash our history by not only enslaving us to their western principles but also by taking hold of our artifacts in their custody stored in their national museums as prizes of their conquest, in subtle way it still shows the power the western world claims over African nations. During the colonial period, we suffered not only from colonialism, slavery, and economic exploitation but also, and above all, from the barbarous systematic pillaging of all our works of art. – Mobutu Sese Seko. 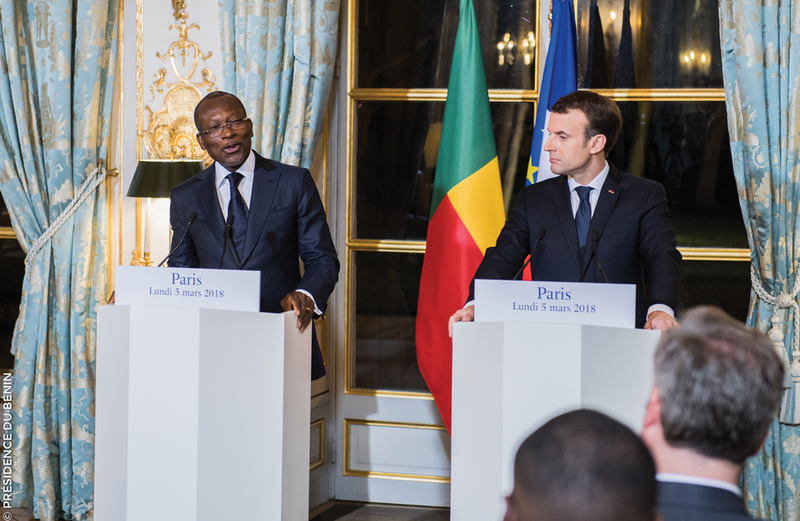 Last year, in November, French President Emmanuel Macron traveled to Africa after he was elected to foster a relationship between the nation and several countries on the continent. During a speech Emmanuel Macron gave at the University of Ouagadougou in Burkina Faso, he lamented “I cannot accept that a large part of cultural heritage from several African countries is in France. There are historical explanations for that,” he added, “In the next five years, I want the conditions to be met for the temporary or permanent restitution of African heritage to Africa.” referring to colonial conquests and ethnographic expeditions of the french which enriched museums like Louvre and the Musée du Quai Branly–Jacques Chirac, with indigenous art from Africa, Asia, Oceania, and the Americas. Marcon led by example by setting up a dialogue group comprising of the Senegalese author and economist Felwine Sarr and French art-historian Bénédicte Savoy to forge a concrete plan for the repatriation of art back to their homelands. Other countries are following suit as the British government said they were open to the idea of loaning back Benin kingdom’s bronze statues stolen from Nigeria, the statues were pillaged in 1897 as British forces sought to wipe out the kingdom in what is known as the ‘punitive expedition’ for acts deemed an upfront to the colonial-occupier government, Quartz reports. The museums taking part in the Benin dialogue group hope to establish a permanent display in Benin City, Nigeria, using items rotated from a consortium of reputable institutions. The negotiations involve authorities from Nigeria and the neighboring country of Benin. The moral case is indisputable. 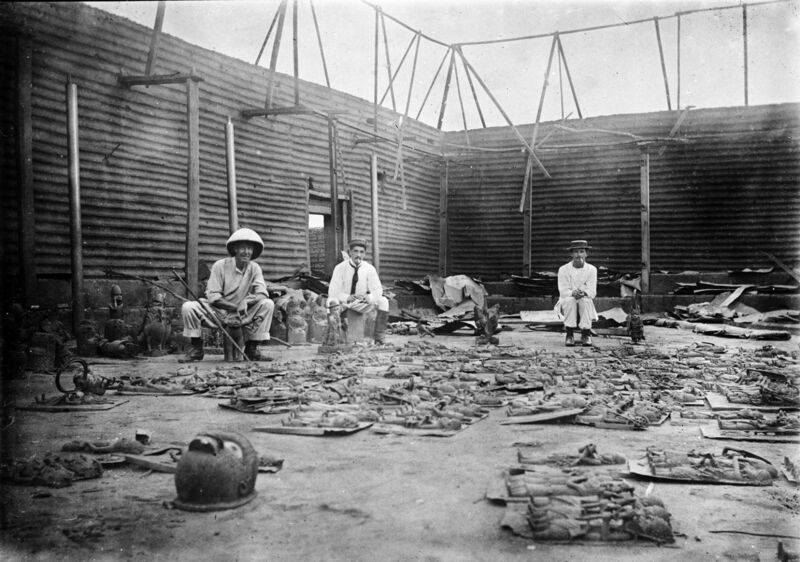 Those antiquities were lifted from Benin City and you can argue that they ought to go back. On the other hand, the rival story is that it is part of world art history and you do not want to take away African antiquity from somewhere like the museums in Paris or London, because that leaves Africa without its proper record of antiquity. 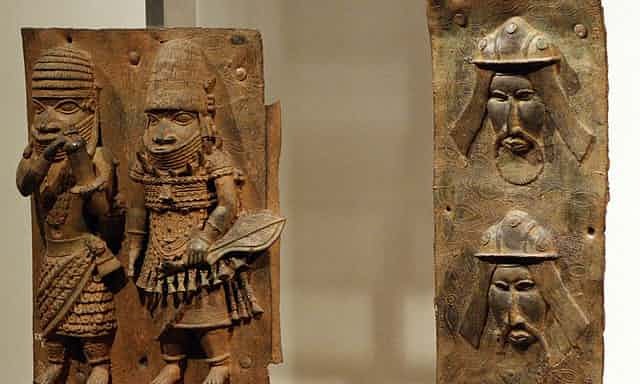 There has to be some sort of negotiation and a recognition perhaps that things are on long-term loan from Nigeria, John Picton, a professor at Soas University of London (formerly the School of Oriental and African Studies) and a former curator of the National Museum in Lagos said. Patrice Talon and Emmanual Macron at University of Ouagadougou in Burkina Faso in November 2017. More than a century after they were looted by British forces, Ethiopia has also agreed to a similar move by the Victoria & Albert Museum to have its stolen art loaned to them on a long-term basis. This isn’t the first time an African country has tried to get it’s art back but in our more progressive world these acts are taken more seriously and slowly we’re making headway, yet we should still ask why our art should be loaned back to us instead of returned, some may argue that the terrible state of governance, corruption and poor facility management will put us at a disadvantage of preserving and managing the art nonetheless a first step of getting them home should be prominent to sparking a narrative of artistic preservation needed.